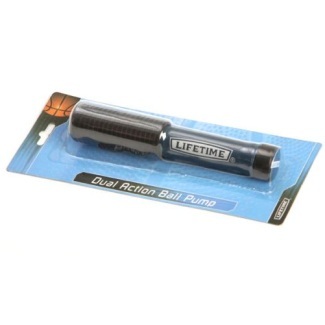 Lifetime Basketball Accessories - 0822 Dual Action Ball Pump. Free shipping to the lower 48 United States for this dual action ball pump. This ball pump from Lifetime Products features a dual-action pump design. Each pull and push of the pump arm fills the ball with air, filling your basketball twice as fast. The 0822 features a hard-plastic covering and comes with 1 needle. Order your Lifetime basketball accessories here. Pump color: blue and black. Material of construction: hard plastic. Dual pump design means that pulling out and pushing in the pump inflates the ball. Comes with a 90 day warranty from Lifetime Products. Ball pump width: 1.5 inches. Dimensions: 8" x 5" x 1"